This year has seen the end of Sydney and Melbourne’s extraordinary house price growth. The slowdown in the two biggest markets meant May was the first month national house prices fell since December 2012. Dwelling price data from property research centre CoreLogic shows Sydney’s median home price fell 4.5% in the year to June 30, while Melbourne’s yearly growth was just 1%. Sounds like good news for first-home buyers, right? Will entering the market when values are falling mean young buyers have more of an opportunity? Unfortunately, the reality isn’t so positive. While it may look like house prices are falling, a closer look inside the market tells a different story. This data from CoreLogic shows that the national housing market is definitely not moving at the same speed or even in the same direction. The biggest falls are in the 10th decile of properties – the most expensive tenth of the market, which also saw the greatest growth in value since 2012. In fact, the top tier of dwellings has seen far more volatility during these boom years. Cheaper houses have seen a steadier, more predictable increase in price. Falling values for the most expensive homes are dragging national prices down even though the cheapest properties (especially in regional areas) are still seeing price growth. The bad news for Victorian buyers is that these affordable properties are still seeing double-digit price increases, which is not the case in New South Wales. An analysis of the bottom quarter of Melbourne’s housing market by Domain Group found first-time buyers were flocking to growth areas on the city’s fringes, driving up prices. Werribee’s entry-level house price rose from $351,000 a year ago to $430,000 in June and an entry-level home in Frankston now costs $535,000, up from $430,000 a year ago. What’s responsible for this growth when the wider market is cooling down? It comes down to the demand for and (lack of) supply of affordable housing. There’s been plenty of attention paid to the issues first-home buyers have in purchasing a place to live. It’s been one year since the Victorian State Government introduced a stamp duty exemption for first-home buyers if their new property was less than $600,000, with a stamp duty reduction offered for sales between $600,000 and $750,000. The Federal Government started the first home super saver scheme last year to encourage people to grow their future home deposit. While the full impact of these measures will take a while to become evident, they are demand-focused and don’t assist with the supply of housing. The first home owner grant (FHOG) is one policy criticised for focusing only on the demand side of the housing equation. 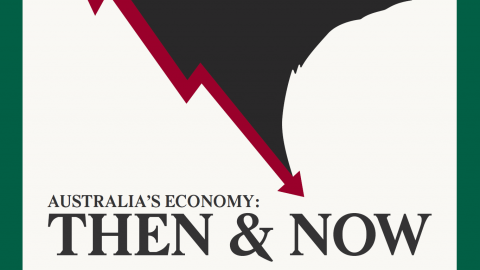 Used by the Howard Government in 2001 and the Rudd Government during the GFC to stimulate aggregate demand, it inflated the prices of entry-level properties. Over time, governments have responded to this criticism by restricting the type of homes the grant can be used to buy. The current grant in Victoria is set at $10,000 for purchase or construction of a new home, with $10,000 more for choosing a regional location. This better targeted policy assists by spreading demand away from Melbourne but also by boosting future supply. This has led to an increase in construction activity in regional areas, but has also seen Greater Geelong house prices shoot up by 11% in one year. In case competing against other potential first-home buyers isn’t difficult enough, banks have started to make it more difficult to get a loan. This means asking for far more details about borrowers’ living expenses or requiring at least a 10% deposit, rather than the minimum 5% which was widely available during the boom years. Part of this push to tighten lending standards has come from the banking royal commission, in which 420 Westpac loans were revealed to have incorrect borrower information. UBS analyst Jonathan Mott estimated 30% of those loans misrepresented the borrower’s financial position. 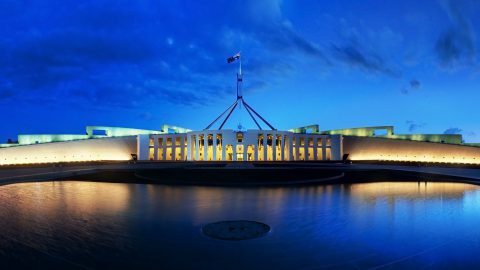 This has the effect of lowering the borrowing power of the marginal first-home buyer – in other words, the marginal buyer last year would not be able to take out a home loan this year. 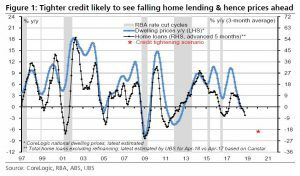 Both Macquarie and UBS have identified lower levels in the maximum amount of credit extended to borrowers since 2015. UBS forecasts house prices to fall further over the next year as a result of credit tightening by banks. 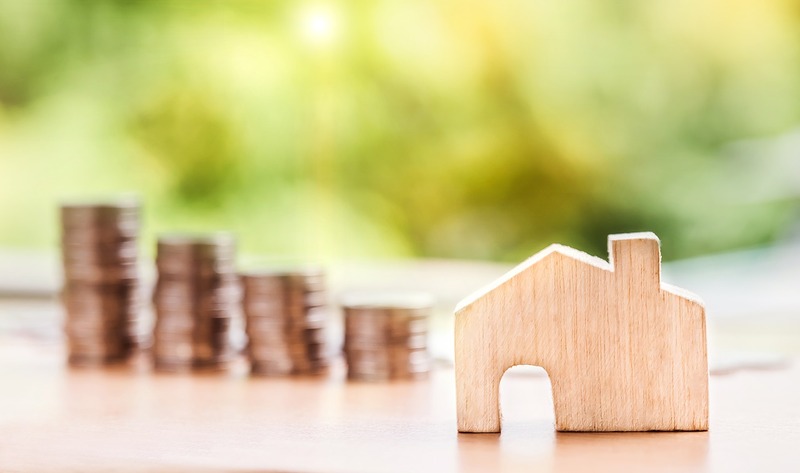 With entry-level house prices still rising and mortgages becoming harder to come by, it’s tough to see the positives for people looking to break into the market. There’s lots of government assistance stimulating demand though, which is definitely worth taking advantage of. 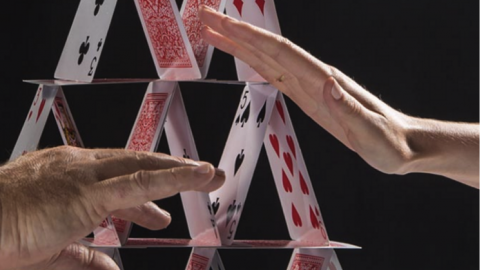 Negative gearing: Glue in the “House of Cards”?